This letter rack is contemporary in style, but it follows a principle popular for more than a century - making construction a visible feature of the design. The solid oak front and back pieces are drilled through with contrasting hardwood dowels to form a cage for the letters, and the ends of the dowels form a rivet pattern around the front face. You can tackle this project by buying plain dowel from the DIY store, but if you have a lathe you can make your own dowels in any hardwood you choose, like the bubinga I used here. I often use hardwood dowels as decorative inserts in bowl turning, but it also has limitless possibilities for furniture. Try it out with this letter rack, and see where else it leads you. It is always best to make a full-size or scale drawing before you start any project so you can work out the exact dimensions of the parts. 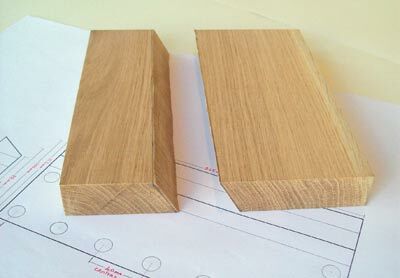 You can make the front and back pieces from a block of oak 203 x 265 x 32mm (8in x 10in x 1in) if you cut it at an angle of 28deg to get two pieces with the measurements illustrated in the drawing. 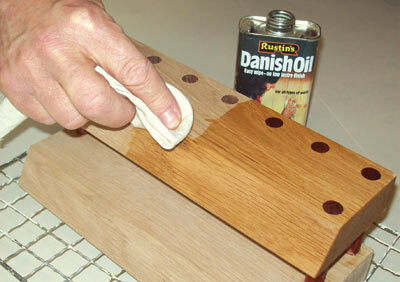 Carefully draw the hole positions on each piece and mark them with a bradawl. The holes must match up exactly on each piece, so accuracy is essential. You need to leave about 5mm between the edge of the wood and the edge of the hole, therefore the hole centres need to be 5mm + the drill diameter from the edge. I used a 13mm drill, so my centres are 12mm from the edges. The intermediate dowels need to be spaced evenly in a dead-straight line along the bottom, so draw the line from end to end and measure the spacing along it. 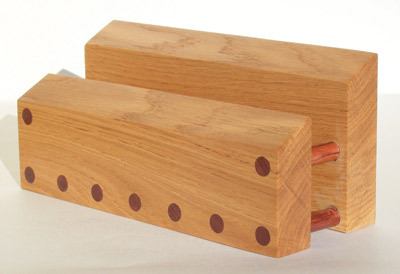 For the dowels to line up on the front and back it is essential the holes are not only in the same position, but are drilled absolutely vertically. 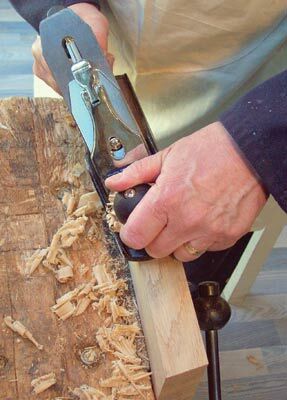 Without doubt the best tool for this job is a pillar drill, so if you have one use it. 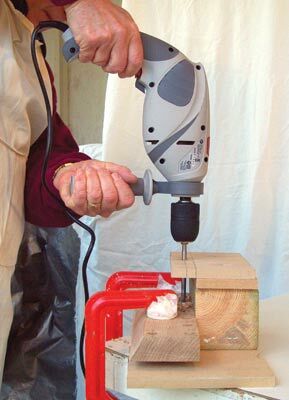 However, a pillar drill can be a fairly expensive piece of kit if you don't need it regularly, so if you don't have one and don't want to splash out the cash on buying one, make up this simple jig instead. The object of the jig is to hold the shaft of a flat-bit drill in a fixed position directly above the centre of the hole to be drilled. Drill a hole in a piece of MDF the same size as the shaft of the flat bit (a little grease for lubricant will help the shaft spin freely without burning the MDF). 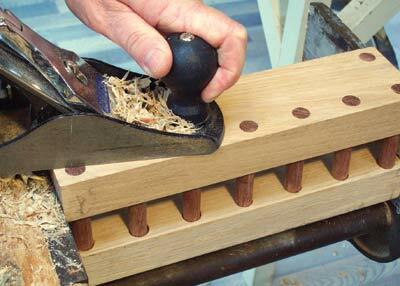 Clamp the work piece to the jig, and the jig to the bench so nothing can move about. 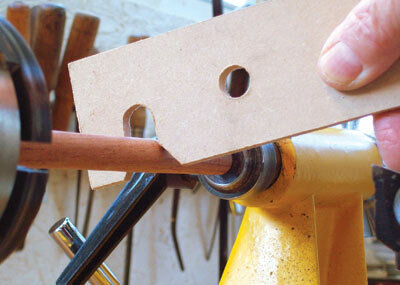 Tap the end of the flat-bit into the bradawl hole, attach your drill to the shaft and carefully drill out your holes. Don't forget to put a waste board under the work piece to prevent break-out when the drill comes through the back. 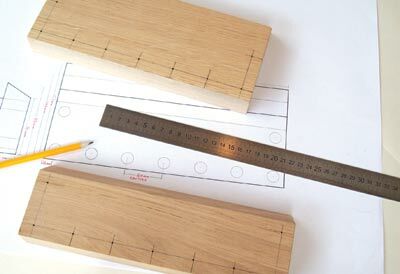 If you want to keep it simple and buy dowel from the DIY store, just remember that you need to drill your holes exactly the same size as the dowel. But if you have a lathe, you can open up a whole new world of possibilities by making your own dowels in any wood you like and in any size you like. Just cut a length of hardwood with a square-section slightly thicker than the dowel you want to end up with. 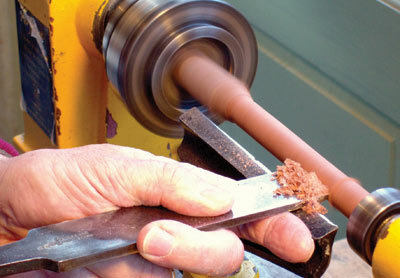 The length is optional, but to avoid it whipping on the lathe keep it under 305mm (12in) for a thickness of 13mm (ï¿½in). 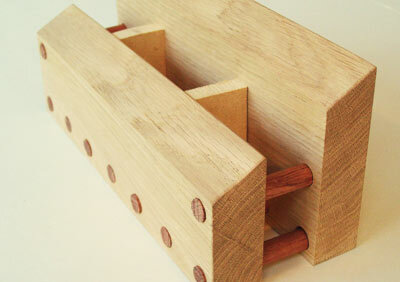 The dowel must have a precise and even diameter along its whole length, so another jig is called for. Just drill two holes of the required size in a piece of MDF. When the slot exactly fits the dowel all along its length, take it off the lathe and double-check by sliding it through the round hole. When you are satisfied with the fit, finish off the dowel on the lathe by sanding it to a smooth finish. Whichever route you took to get here, you should now have holes and dowels which fit each other exactly, and are all in the right positions. Cut the dowels to length about 80mm (31/8in) so that, when you have assembled the front and back sections with a 36mm gap between them, the dowels will project about 1mm from the front face. (see photo 8) Cut up some MDF to make two 36mm spacers for the letter gap. Test everything for fit, then glue the thing together. Put the assembly in a vice, line up the rods with the holes, and gently compress onto the spacers until the dowel ends poke through the front. Wipe off all surplus glue and slide out the spacers.